A clarification in terms: rugs are loose floorcoverings that are laid out, while carpets are fitted wall to wall and affixed to the floor. Most rugs and carpets may be divided into two basic categories: flat-woven and piled goods. Flat-woven carpets are reversible; either side may be used as the yarn is “trapped” between the warp. Piled carpets have a decorative surface wherein the yarn faces upwards after passing through the warp and weft. 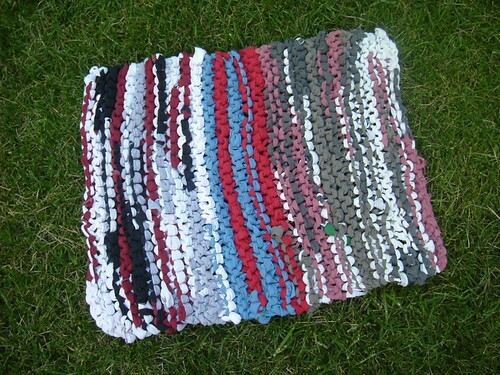 The underside of a pile carpet is composed of densely compressed yarn that is neither comfortable nor decorative. We’ve all seen examples of flat-woven carpets: they can be as simple as rag rugs but typically, we think of tribal rugs or indigenous people’s craftsmanship such as those made by the Navajos or Kilims from the Middle East. The thickness of these floorcoverings is limited to the fullness of the yarn that passes from side to side on the loom. Flat-woven rugs were created by hand-powered looms, in limited quantities, and each was unique, as the weaver selected the pattern and color of the yarns with each pass of the shuttle. A dramatic change in the production of textiles occurred in 1785, when Edmund Cartwright invented the power loom, and the ability to create mass-produced fabric, which included carpet. This was followed by the invention of the jacquard loom in 1801 by Joseph Marie Jacquard. The jacquard loom was programmed by punch cards that instructed the loom to automatically place color, and thus pattern, in a repeating, preselected manner. (Those of you of a certain age will recall the old IBM computer cards). In the years between the invention of the power loom and the jacquard loom, there was no way to add pattern to carpets unless the weaver altered some aspect of the weaving by hand, and changed the colors of the yarn. A striped form of carpet, known as Venetians became popular, and these were created by dressing the loom with different, usually bright, colors of yarn in the warp. Venetians were, as previously mentioned, woven in narrow strips between 27 and 36 inches wide that were (and are still) hand-sewn together and tacked down around the perimeter of the room. Note on this specific example of Venetian carpet, the tiny alternating repeat called a ladder stitch). Venetians remained popular well into the first half of the 19th century, when they were eclipsed by a patterned version of flat-woven carpet termed Ingrain. Although known as Ingrain carpets in America, these goods are also referred to as Scotch or Kidderminster carpets in Great Britain, and were very popular throughout the 19th century. Due to the jacquard loom, they could be woven in patterns with both smalland large repeats; the length of pattern repeat was determined by the number of punch cards that programmed the loom for each design. Another clarification: The British carpet industry was and is centered in the city of Kidderminster in the Midlands; many other types of carpets are woven there, including Brussels and Wilton, but there is an occasional confusion between the flat-woven Kidderminster carpet, and all the other floor coverings produced in the fair city that bears that same name. With the ability to mass produce not only carpet, but patterned ones at that, manufacturers were now able to design floorcoverings that would coordinate popular fashion in other home furnishings and architecture. The now burgeoning middle class desired goods for their homes, and the number factories mushroomed to accommodate their demand. Just as wallpaper, furniture and decorative objects were being created in fashionable styles, so too were carpets. For example, in the middle of the 19th century, the Rococo Revival was a hugely popular style of furnishing. We’re all familiar with Rococo revival furniture, wallpaper and lighting, but note that carpet was a critical part of the design scheme, and essential to the appearance of a well appointed room in, say, the 1850s. As decorative arts evolved over the course of the Victorian era, so too did carpet designs. In a future post, I’ll go into this evolution of interiors and how carpet patterns were adapted to it. select Ingrains to be fitted in the upstairs rooms.